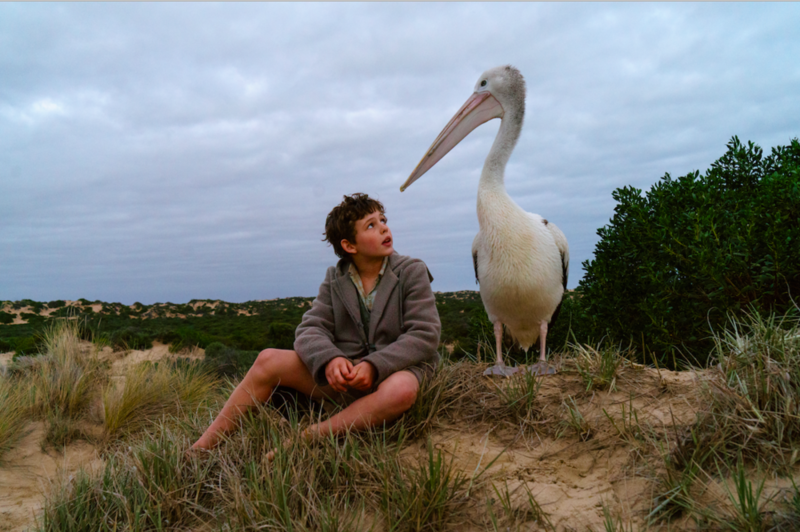 A moving folk tale crosses a generation or two in “Storm Boy,” a charming family drama from Australia. One day, Michael hears the shotgun blasts of hunters and goes to investigate. He finds a nesting ground, along with several pelicans shot and left for dead. He also finds a nest of three scrawny pelican chicks whose mother has been killed. Michael, aided by a native, Fingerbone Bill (Trevor Jamieson), picks up the chicks and decides to raise them himself. After some work, and a lot of ground up fish guts, Michael has three full-grown pelicans in the house: Mr. Proud, Mr. Ponder, and the runt of the group, Mr. Percival. When the three are grown, Tom tells Michael he has a difficult task: To release them back into the wild. The framing story for this one features Geoffrey Rush (“The King’s Speech,” “Shine”) as an aged Michael, recounting the story to his granddaughter, Maddy (Morgana Davies). Maddy is arguing with her father, Malcolm (Erik Thomson), over the father’s decision to have the family business — on whose board Michael is an emeritus member — lease farm land out for mining, a decision the environmentally minded Maddy strenuously opposes. Seet and Monjo neatly tie together the two stories, through Rush’s avuncular narration and through a common theme of parents and children in conflict. The result is a narrative that is at once rustically nostalgic and refreshingly modern, nicely pitched at younger viewers without talking down to them. Seet is also blessed with gorgeous Australian scenery to shoot, and a cast that underplays the melodrama well. There’s also a cameo by the great native Australian actor David Gulpilil, who played Fingerbone Bill in the 1976 version, and plays that character’s father here. “Storm Boy” is also an answer to parents who complain that there are never enough family-friendly movies, or that the ones that exist are all part of the Disney oligarchy. This one is a small delight, for all ages, so don’t let it get away. Opens Friday, April 5, at theaters nationwide, including the Megaplex Jordan Commons (Sandy), Megaplex at The District (South Jordan) and Megaplex Thanksgiving Point (Lehi). Rated PG for some thematic elements, mild peril and brief language. Running time: 99 minutes.